Following their successful programme entitled ‘A Women Thing’, a congenial homage to their musical heroines, Les Brünettes felt ready for a ‘boys thing’. And who better to choose than the epitome of all boys groups, the Beatles? Seen through the eyes of four women, we are treated to exhilarating close-up of the Fab Four’s life and music. To get even closer to the Beatles’ spirit, Les Brünettes recorded their album at the famous Abbey Road Studios in London – the very place where Paul, George, Ringo and John wrote and recorded many of their greatest hits. Taking their inspiration from the Fab Four, the arrangements involve highly creative, playful and sometimes tongue-in-cheek flights of fancy. The girls dust off popular hits, discover lesser-known tracks and link songs together in surprising ways. 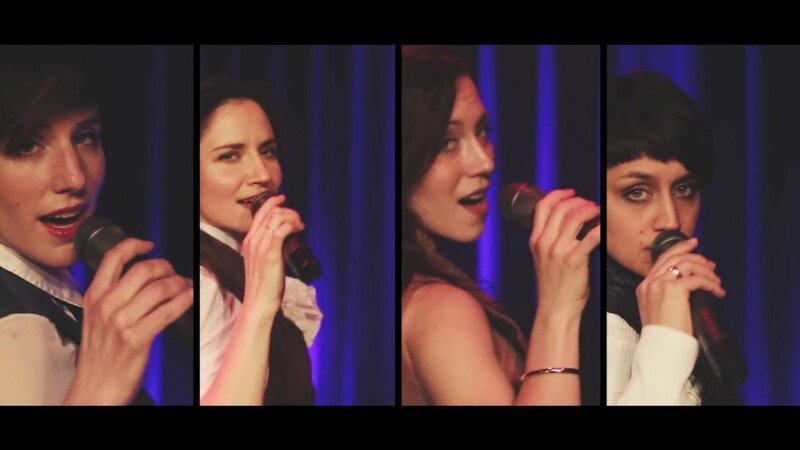 In their own songs, Les Brünettes describe what it is about the Beatles that holds them in its thrall. Short scenes, dialogues and film clips provide a dramatic framework for the music, putting an ironic, whimsical and reflective, yet always unexpected, spotlight on the world’s most famous pop band.